The annual poetry weekend is upon us! 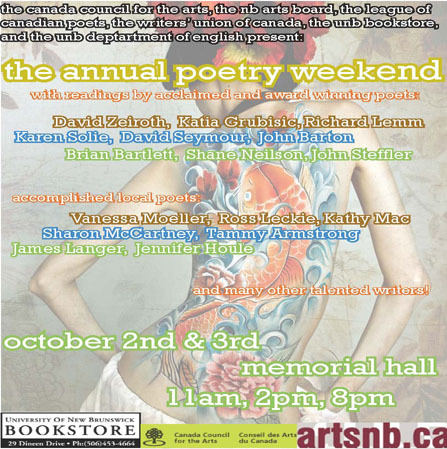 Once again UNB Fredericton welcomes many acclaimed Canadian and local poets at this weekend-long poetry festival. Come hear many of your favorite poets read their work. 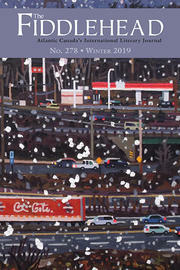 Featured poets such as John Steffler, Sue Gillis, Anne Compton, Brian Bartlett, Richard Lemm, David Zieroth, Johanna Skibsrud, Karen Solie, Shane Neilson, Sharon McCartney, Katia Grubisic, matt robinson, Vanessa Moeller, Michael deBeyer, James Langer, Tammy Armstong -just to name a few- will be reading this weekend! Come and join us for a wonderful time. 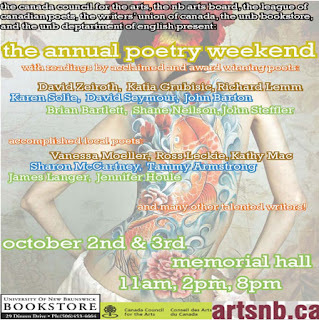 Readings take place at UNB Fredericton, Memorial Hall on October 2nd and 3rd. Six separate readings will be held from 11am, 2pm, 8pm. We'd love to see you there!